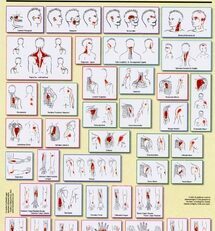 This full color set of two wallcharts depicts photographs of an actual patient on whom a team of trained and experienced practitioners worked for over 26 hours to find and mark the points and meridians of TCM. Each point was located by cun/sun measurement and anatomical position and verified by touch and response from the trained model. Because the work was done directly on a real 6’3″ African-Caucasian body, the relative positions of points and meridians can be directly inferred, avoiding the errors of interpretation that artists’ impressions may make. The photography uses lighting that accentuates the detail of the linework with respect to the surface anatomy and delicately portrays the contours of bone and muscle, so essential for accurate point location. In each image one side of the model is in anatomical pose, the other holds a modified stance to allow presentation of points such as HT-1, KI-1, LR-12. In many cases the pose also allows the meridians to be followed from beginning to end in one view. 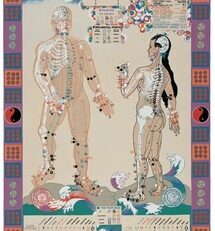 Digital editing was used to correct and colorize the linework in this set of two 28″ x 40″ charts (yin aspect and yang aspect), which has been labeled according to the WHO naming conventions. The precise coloring system conforms to classical five element theory. The chart also shows the Shu/Phase, Yuan-Source, Back-Shu, Front-Mu, Xi-Cleft and Luo-Connecting points. Detailed legends on the side panels provide additional information. With its detail, careful attention to accuracy, and beauty of presentation, this chart uniquely justifies its place as teaching aid, study tool, or decoration. 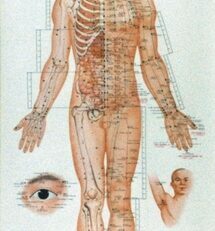 See also the Living Meridian Location Chart: Combined TCM & Zen Shiatsu and Living Meridian Location Chart: Zen Shiatsu.